Stunning resort in Fiji with over 500 ft of waterfront on 20 acres of crown freehold property located near the Astrolabe reef, a divers paradise. Make this oasis your private home or let it continue to be a resort. The options are endless. The property is located in a marine reserve, tucked inside of the Great Astrolabe reef. This healthy and gorgeous reef is the third largest in the world. Enjoy access to excellent water sports, snorkeling, scuba diving, sailing, etc. Only accessible by air transport or boat. There is a fully furnished home & guesthouse. The main house offers 20 foot vaulted ceilings, hardwood floors and furnishings of excellent quality. The design of the main house at this Fiji resort has 1,800 sqft and allows for expansion without changing the main structure. The guesthouse is 900 sqft with two bedrooms, bathroom, living room, tile floor throughout block and rendered structure fully furnished, with plunge pool and extensive deck 15 feet above sea level. The property has a 625 sqft fully equipped workshop and separate male and female, furnished staff quarters .The generator & compressor building provide back up power and compressed air for scuba diving and pneumatic tools. 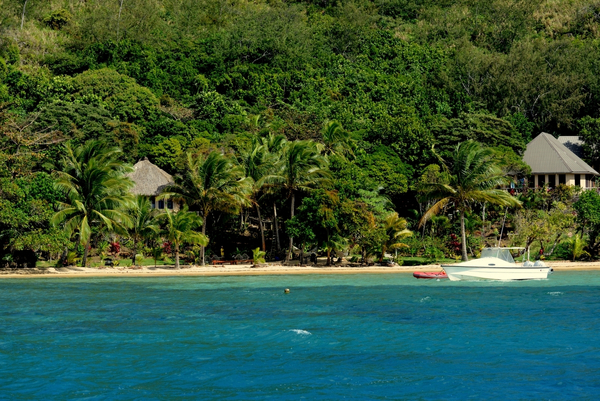 Fiji resort could expand to a “standard up market resort” or it can remain small and operate as a resort or home with a guesthouse for friends and family. You won't find another Fiji resort for sale with such beautiful beaches and built with every detail in mind.